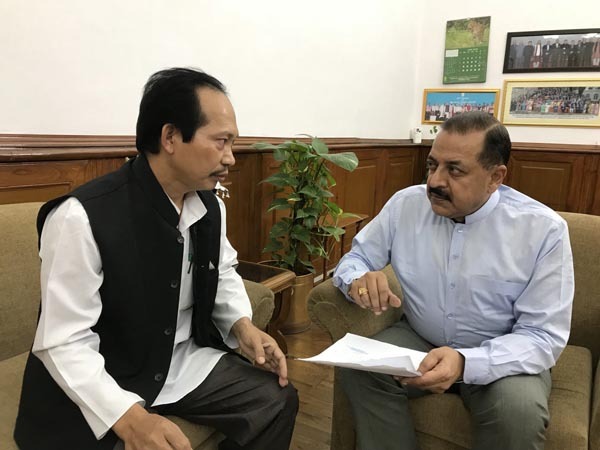 Shanti Jiban Chakma, Chief Executive Member of the Chakma Autonomous District Council (CADC) in Mizoram called on DoNER Minister Dr Jitendra Singhon Monday. They had a discussion on a wide range of issues related to the development as well as socio-political concerns of the Chakma community. Official sources said that the agenda of the discussion included Border Area Development Programme (BADP) and Chakma Autonomous District Council’s demand that it should be involved in the planning and implementation of various schemes under BADP of the Ministry of Home Affairs. The Chakma Autonomous District Council is an autonomous council for ethnic Chakma people living in South-Western Mizoram bordering Bangladesh and Myanmar making it a strategically important area, calling for special attention. The CADC CEM also handed over a memorandum to the DoNER Minister, which, among other things, called for amendment of the 6thSchedule of the Constitution, in order to provide more administrative power and financial support to the council. He also made a request for revision of the salaries of teachers recruited from time to time on fixed pay basis. Shanti Jiban also handed over relevant papers, relating to the allocation of funds as the financial grant for the modernization of Kamalanagar, to Dr Singh. Sources said, Dr Singh listened to the issues raised by the Chakma council chief and his team. The minister said, since most of the issues were not being directly dealt by the Ministry of DoNER, he would try to take up the issues with the relevant departments in the Ministry of Home Affairs, NITI Aayog and the Mizoram State Government.